The latest update to IATA’s 20-Year Air Passenger Forecast, shows that an increasing shift Eastwards in the center of gravity of the industry is behind the continued strong growth. Over the next two decades, the forecast anticipates a 3.5% compound annual growth rate (CAGR), leading to a doubling in passenger numbers from today’s levels. 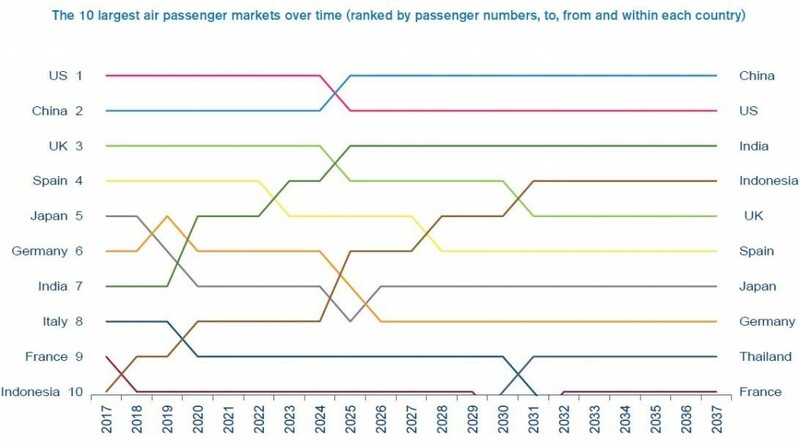 The Asia-Pacific region will drive the biggest growth with more than half the total number of new passengers over the next 20 years coming from these markets. Growth in this market is being driven by a combination of continued robust economic growth, improvements in household incomes and favorable population and demographic profiles. China will displace the United States as the world’s largest aviation market (defined as traffic to, from and within the country) in the mid-2020s. The rebalancing of China’s economy towards consumption will support strong passenger demand over the long term. India will take 3rd place after the US, surpassing the UK around 2024. Indonesia is forecast to be a standout performer—climbing from the world’s 10th largest aviation market in 2017 to the 4th largest by 2030. Thailand is expected to enter the top 10 markets in 2030, replacing Italy which drops out of the ranking. Globalization Reversed or Liberalization Increased? The 3.5% CAGR to 2037 assumes an unchanged policy framework over that period. Policy shifts, however, are likely over time. Should protectionism continue to expand in a "reverse globalization" scenario, aviation would continue to grow, but at a slower pace and deliver fewer economic and social benefits. Under a liberalized environment connectivity would generate significantly more jobs and GDP growth. "Global prosperity depends on air connectivity. Aviation is sensitive to policies that either support or undermine growth. And these seem to be pointing in the wrong direction. Dampening demand for air connectivity risks high quality jobs, and economic activity dependent on global mobility. This forecast is a cautionary warning to governments. First, the industry will grow but they must clear the infrastructure bottlenecks to bring that growth to their home markets. And secondly, governments must understand that globalization has made our world more socially and economically prosperous. Inhibiting globalization with protectionism will see opportunities lost," said de Juniac. No matter which growth scenario comes to pass, aviation faces an infrastructure crisis. Governments must work closely with the industry, to be more ambitious in developing efficient infrastructure, fit for purpose, and offering value for money. "The world stands to benefit greatly from better connectivity. However, at this rate, airports and air traffic control will not be able to handle demand. Governments and infrastructure operators must strategically plan for the future. Decisions made now will have an impact on the value created by aviation for their regions," said de Juniac. The increased demand to fly creates a responsibility to expand in a sustainable manner. The aviation industry remains committed to its goals of carbon-neutral growth from 2020 onwards and cutting CO2 emissions to half 2005 levels by 2050. "Commercial aviation is one of the only global industries to take on such comprehensive environmental targets. With mandatory emissions reporting beginning on 1 January 2019 under the Carbon Offsetting and Reduction Scheme for International Aviation (CORSIA), this will help rally the industry to invest in more fuel efficient aircraft and sustainable aviation fuels," said de Juniac.